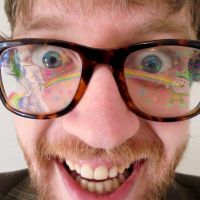 One of the fastest rising comics in the North, Rob Mulholland is a very odd man who is much less creepy than he looks. He is very tall and very funny. He once made a lady wee herself during a set and a bit of it went in her shoe. His jokes are rapid-fire, his jeans are too tight and his jackets were once owned by dead men. He tells jokes about the similarities between penises and olives, homeless adult babies and internet drug deals.